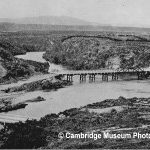 Early in 1870 the site for a Bridge over the Waikato River was surveyed by Captain Rickards. The river was at a record low level so it was easy to bore holes into the rocks at the bottom of the river to put in the foundation piles. Sub-Inspector Newall and Sergeant Chitty of the Armed Constabulary superintended the job, which was completed in 1871. On 17 November 1874 the river rose 25 feet in a few hours. The flood lifted the bridge and floated it down the Waikato River to Hamilton , where it was rescued by the Armed Constabulary. The old punt was brought back into service. The Fergusson Bridge has been built on the exact site of the Old Red Bridge (off the end of Shakespeare Street onto SH1) with a three-to-one government subsidy. The Fergusson Bridge was named after Governor General, Sir Bernard Fergusson, who had family living at the Gorton Estate (Karapiro) in the 1870’s. This bridge was opened in 1964 with the firm North, Swarbrick, Mills and Westwood winning an award for its design.